After last year's release of the Rockey Mountain Crater Caps in Godspeed SA colors, MiTo reached out to me and encouraged me to further develop the sculpt into a profile better suited to the XDA profile, and was kind enough to send me color samples for XDA Godspeed. I owe a huge thank you to MiTo for contacting me and giving me the tools to get my latest project to the launch pad. 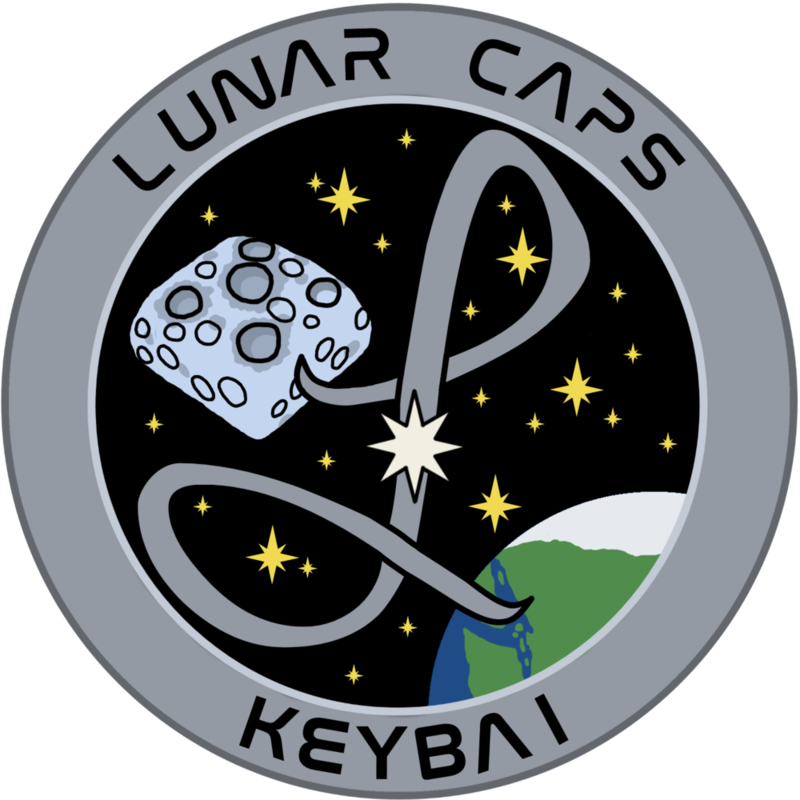 Godspeed Mission Lunar Caps mission badge. Every order includes a free sticker! 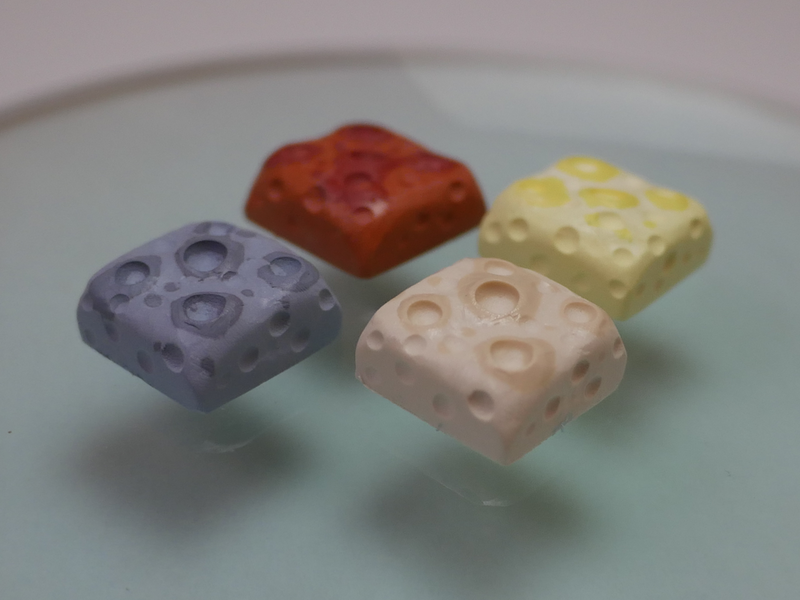 Lunar Caps are each double shot, with the first shot of resin being carefully "painted" into the mold to highlight the craters, and to give every cap a one-of-a-kind look. Colors are based on official Godspeed XDA colors and come in various values, and complimentary chromas to create contrast between the shots, and further make every Lunar Cap unique. Lunar Caps 4 colorways offered: Zn (blue), Au (yellow), Pt (beige), and Fe (orange/red). We'd like to get this mission off the ground right now, but it looks like our optimum launch window will be on Saturday March 10, 2018. Stay tuned in to @keybaicaps on Instagram for more news, and countdown to T minus 0:00. Thanks again to MiTo, and to everyone who has supported this mission with kind words. I couldn't have done it without you. I am swimming in caps to sell right now. We just got authentication cards, and Keyfur the Beaver decals as of yesterday. But as badly as I wanted to, and as hard as I worked for it, it's just too close to the wire for me to pull off a raffle sale today. I need to know everything is perfect, and be able to give a raffle sale my full attention to guarantee it's success, and I just can't promise that today. More likely it's going to be next weekend. I know a lot of you have asked when the sale would be, and I've tentatively said it might be today, so since I can't do a sale, I'm going to do a giveaway instead! Keep your eyes open over on r/MechMarket, I will post there shortly, and also drop a link here once it's up. Thanks for again for your patience and support. Good luck in the giveaway! I expect the first of a few raffle sales for Keyfur the Beaver, and the iconic Rockey Mountain Caps to happen sometime in July. The Keybai crew (both of us :P) will not be able to ship orders this week. Orders placed this week will be shipped on Tuesday July 4. Thanks for all the support in making our first raffle sale such a success. It's been a crazy couple of months since then for us, on a personal, IRL level. With no small amount of turmoil. The site is still active and we're fulfilling orders regularly, but our casting and design has been on pause while a few things get sorted out. The good news is that we expect to resume casting, and working on new designs in the next week or two. So expect some new caps soon! Thanks for checking out the site and our caps. We look forward getting more keybai caps on more keyboards ASAP. "Whereas our main line of artisan keycaps will be offered for sale in raffle sales, and other promotions, our newly branded "Second Line" will be offered as website exclusives." Second Line is our line of production seconds which are beautiful, perfectly viable, artisan keycaps, which for some reason or another didn't quite pass our quality assurance inspection. As a result, we're offering them as website exclusives, for deep discounts. We strive to offer only the best keycaps in our main line sale caps, so if caps come out of the mold with little things wrong with them, we just won't sell them for full price. Loose Booties - These caps do not fit tightly to a Cherry MX stem. When flipped upside down, they may fall off the stem. They would otherwise be indistinguishable from main line caps, so they are marked on the underside. (main line price -%25) psst! - put a small piece of Scotch tape on your stem and they will fit tight. First Details of Tomorrow's Sale! First From the Post Sale opens tomorrow, and as promised, all the details are posted here first! You can find all the images here. The raffle entry form is here. The raffle will be open from Friday March 31, 2017 at 8:00 AM (PST, GMT -7), and will remain open until Sunday April 2, 2017 at 8:00 AM (PST, GMT -7). 11 colorways will be offered. Entrants may prioritize up to 11 colorways they wish to purchase, or may specify “any,” or “none.” If your first choice is not available, I will try to fulfill your next choice, or choices progressively. If you select "Any" you will be invoiced for a random keycap(s) based on availability. If you select "None," or make no selection at all, and none of your other chosen colorways are available, your entry will not be fulfilled. All the terms and conditions can be found at the end of the form. If you have any questions, feel free to contact me through the site, or by PM on Reddit (u/keybai). A Couple More Pictures - Sale Friday! Looking at a busy rest of the week, and I'm not too sure how much time I will have to make more updates to my News page. But I did want to post a couple more pictures here for those of you coming here to check it out. Your eyes do not deceive you; I really did name the above colorway after the Icelandic volcano Eyjafjallajökull. XD In one of my first threads on r/MK about these Rockey Mountain Caps, I had a request to make one that looked like a volcano. That lead to this cap, and post-casting sculpting process of creating the caldera. The colorway here may, or may not match SA Industrial keyset from PMK. Last cap to show off tonight is in the Sawtooth colorway. This originated in the same thread on r/MK, also as a request, to make a cap that looked like the Sawtooth Mountain range in Idaho. This colorway is double shot, with one solid grey shot, and the other shot being a white / bluish white swirl. I like being able to take someone's idea and make it a reality for them, so I will always try to take colorway and sculpt requests. I'm super proud of how both of the 2 above caps turned out. My first raffle sale will be opening this Friday! The full menu of available caps, and a link to the entry form will be posted here first. The first entry that I get that mentions reading this from this News page will receive a small bonus as a Thank You for following my work. I spent some time yesterday taking photos of the new Rockey Mountain Caps. I hope to run a raffle sale later this week, and needed some good shots of the 11 (yes, eleven) new colorways that will be offered. In addition to the triple shot colorways that have been the foundation of the Rockey Mountain Caps, I will have some totally new designs including double shouts with additional resin painting, double shot swirls, and some pretty amazing "Crater," "Caldera," and "Crystal" caps. Recent events have brought to out attention the need to improve how we handle payments and shipping. In reviewing the policies of the payment gateways available to us, we have made the decision to now handle all of our billing and payments through PayPal. PayPal is a trusted money transferring service, is the defacto standard payment method in the mechanical keyboard community, and makes payment easy and safe for all. As a result of now using PayPal, all of our shipments will now have tracking! That's great for the visibility and security of your goods, but of course comes with a cost. We are no longer able to provide the low cost shipping options (which did not have tracking) that we used to offer. That means our Canadian and US customers will have to pay a few extra bucks for shipping. But those few extra bucks buy a lot of value in terms of shipping and security. As our volume grows, we hope to adjust our shipping costs, and start to absorb some of that expense to bring the shipping costs down, and continue to provide the best vale for our customers and fans! Through a lucky series of events facilitated by our good friends at MechKeys.ca, I was able to purchase some outstanding pressure casting equipment. Casting my resin caps in about 4 times atmospheric pressure allows me to cast bubble-free caps. The caps, which will be pictured here in the coming days, are by far the nicest caps we have ever made. We are finally producing artisan keycaps the way we've always wanted to. The pressure pot is a CA Technologies, 2.5 gallon pot designed specifically for resin casting. The build quality on it is amazing. The thing (if you'll pardon the pun) is a tank. The compressor is a small, 1 gallon compressor from California Air Tools, and is the smallest, quietest, yet most robust compressor I have ever used. New caps are coming out of this bad-boy every chance I get. So keep your eyes open for our first official community sale, hopefully sometime this month, and few a few other upcoming news posts about the new and exciting things happening.